When Fred Hirschovits was designing his new hotel last year, he wanted to break the cookie-cutter mold used by so many major brands. Mission accomplished. Mr. Hirschovits’ Holiday Inn Express at Airport Town Center on Alico Road is characterized by flowing modernity rather than blockish traditionalism, a bold color scheme instead of muted pastels, and a restaurant with simple, fresh meals. He also deconstructed the usual imposing front desk into three mobile modules, adding to the hotel’s open, airy ambiance. You can see all the little appointments which are not usual in Holiday Inns. It’s very special. 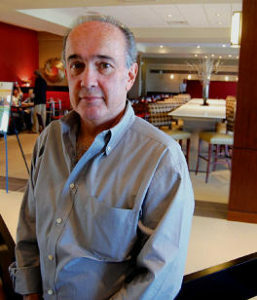 The Holiday Inn Express is the second hotel opened by his Naples-based company, Twenty/Twenty Worldwide Hospitality LLC. (The Holiday Inn brand name is owned by InterContinental Hotels Group). He and his partners also own the Hampton Inn & Suites in Cape Coral and are interested in building a hotel in downtown Punta Gorda. His hotels have consistently ranked at the top of guest satisfaction surveys taken by the companies that own his brands, like InterContinental. Mr. Hirschovits says his education prepared him for such success. A graduate of the School of Hotel Administration at Cornell University, the hotel industry equivalent to Harvard Law, Mr. Hirschovits was groomed by the best. He still wears the class ring and espouses the benefits of the connections made at Cornell, with students from at least 30 different countries. Now 57, he grew up in a family of soccer players in Helsinki, Finland. His father was one of Finland’s top goalies in the 1930s and early ’40s, Mr. Hirschovits says. His brother, 60, still lives in Helsinki and plays soccer recreationally. His grandfather established a Finnish soccer club called Maccabi (“hammer” in Hebrew) in 1906. It functioned under Nazi Germany and continues today. In 1969, Mr. Hirschovits became a high school exchange student in Utica, Mich., just north of Detroit. When he returned to Helsinki, where his parents owned a textile company, his command of English led to a job at a travel agency. He was the man who stood at the train station or the shipyard — “the port of entry,” he says — waiting to greet a Very Important Person and then shuttle them to and from whatever hotel he or she was staying at, pointing out sights along the way. “This is how I became familiar with hotels,” he says. After college, he became a hotel manager in the United States for a hotel group that moved him to six hotels in seven years. For 15 years after that, he worked in an upper-management position for a private hotel company, traveling about a third of the year. During that time he was married, and although it ended in separation, he has a daughter who lives in Tennessee. Mr. Hirschovits lived near her, in Chattanooga, until he moved to Naples in 1996. Besides running his hotels, he sits on the executive board of the Holocaust Museum of Southwest Florida, is a regional vice president of the Cornell Hotel Society and sits on the program advisory board of Florida Gulf Coast University’s Resort & Hospitality Management program. In his spare time, Mr. Hirschovits likes to travel, smoke the occasional cigar and listen to Andrea Bocelli and Luciano Pavarotti. Another one of his favorite pastimes is smoking fish, such as salmon and Arctic char, with his Finnish smoking box. Once a year he travels back to Helsinki, which he compares to Minnesota in the fall, to meet up with a group of five or six old friends, and to see his 93-year-old father. Three months into the opening of his Holiday Inn Express at Airport Town Center, he says things are running smoothly. The moment of truth came a day after it opened in February. The White House staff booked rooms for some of its security team and Secret Service to prepare for President Barack Obama’s visit to Fort Myers the following week. Now he knows. “The team can handle anybody,” he says.